The celebrity chef collaborates with nonprofit End Allergies Together in its first advertisement aimed at educating consumers about sometimes fatal ingredients. On a sunny July day, I approached a food truck called "Khil Mi" in New York’s Madison Square Park. 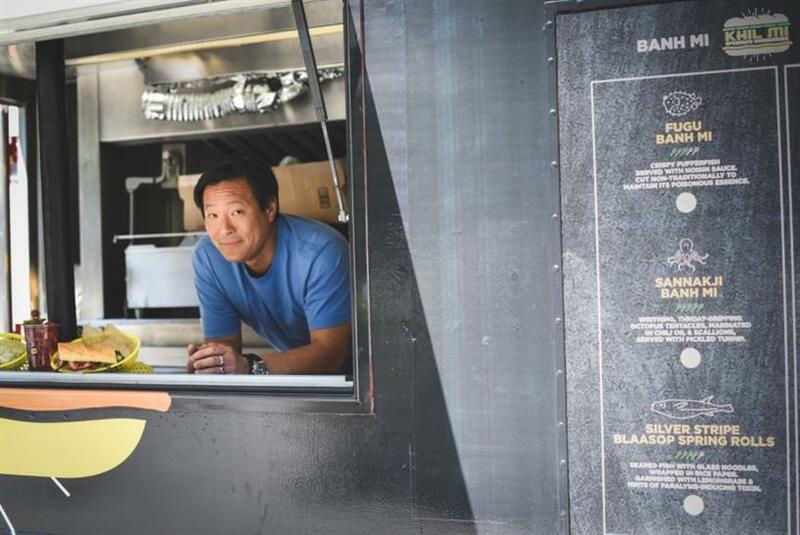 It was manned by none other than James Beard Award-winning chef Ming Tsai. Hungry for lunch, I took my place in line behind another gentleman sporting a Grey Group ID badge (their office borders the park). But it soon became apparent that this was no ordinary Vietnamese sandwich shop. Yes, it was fronted by the same chef who owns restaurants Blue Ginger and Blue Dragon, but everything on his menu could literally kill you—and each item was ranked based on the probability of that happening. Fugu Banh Mi consisted of "crispy pupperfish served with hoisin sauce, cut non-traditionally to maintain its poisonous essence." It garnered 3 out of 5 pitchforks. The Silver Stripe Blaasop Spring Rolls looked more promising, even with a 4 out of 5 pitchfork rating, until I read that they were garnished with "hints of paralysis-inducing toxin." The Grey employee and I soon asked if this was some sort of sick joke. It wasn’t a joke, but we had accidentally walked into a BBDO-produced PSA for the nonprofit End Allergies Together, aptly shortened to EAT. Dubbed "Could You EAT?," the video began airing during movie previews nationwide on Friday and has already garnered more than 22,000 views on YouTube. At 60 seconds in length, it captures live reactions of passersby and ends with a text-to-give prompt. "The goal was to have people walk in our shoes and know what it's like. Because if any adult went to a restaurant where there could be something—a trace—that would kill them, they'd never eat there," said EAT Cofounder and President Elise Bates. "It's absurd, yet it's what people with food allergies do every single time they eat." Bates met EAT cofounder Kim Hall at a food allergy meeting three years ago. The two agreed that they didn’t want to simply learn how to cope with their kids’ food allergies—they wanted to find a cure. So, they developed EAT, which raises money to fund food allergy research. So far, the nonprofit has been successful, getting its message out on CNN and "The Today Show" as well as funding Dr. Cathryn Nagler’s study that discovered a probiotic that eliminates food allergies in mice. It also amassed a prominent following including GE’s Chief Creative Officer Andy Goldberg, who introduced them to BBDO. BBDO Executive Creative Director Michael Aimette has known Goldberg for a long time, and he’s "heard how he's had to contend with food allergies with his son." But "when he got on the EAT board, it became that much more evident that we should work together, do something powerful to get the needle moving on donations towards finding a cure." Thus, the agency decided to take on the pro bono work, but it didn’t book Tsai. Instead, Bates’ husband Greg approached the celebrity chef at his Boston-based restaurant, which happens to be nut-free as Tsai’s son was once allergic to a variety of ingredients. He agreed to star in the video. "I had to give my son an Epipen when he was going into anaphylaxis shock. It was the scariest moment of my life and absolutely life-changing," Tsai wrote in an email. "I fully understand all sides to this story—the challenges for us restaurateurs and chefs to keep restaurants safe and the side of parents with kids with food allergies and how each meal could be their last." For Bates, she hopes "Could You EAT?" will raise money for research, but she also intends for it to "transition from the eye-roll of food allergies to the eye-raise." "When we go to a school or to a birthday party and you tell one of the parents that my child can't eat that, they kind of roll their eyes and think you're being dramatic," she said. "Like, ‘Come on, it's really not life-threatening. It's just a choice.’ And so it's this constant eye-roll of like, ‘Really? !’"
But when those without food allergies are asked by a world-renowned chef if they’d like to eat his poison-packed sandwich, their eyebrows pop, and they "say, ‘Oh, so that's what it's really like.’ Because our kids look fine, right? They're healthy—until they have a bite of something, their entire body shuts down, they need Epinephrine within a very short window of time in order to live and then they have to go to the emergency room and sit there for four hours and be treated." The fact is that 220 million people suffer from food allergies worldwide, and most people think it's a choice, Aimette said. "I think people need to understand the gravity of the situation, and then they'll do something about it," he said. "Obviously something deadly is different from a food choice, like, being gluten- or dairy-free. I think people need to understand that what this could mean when someone does eat peanuts. It's not, 'Oh, I'll take a Benadryl, and I'll feel better.' There's anaphylactic shock and possible death. It's, like, real stuff." Social media agency Hyfn and public relations firm Kriskey Lane Communications also contributed to this campaign.